Chemical Constituents and Components : Main chemical constitutes are tannins mainly include ß- sitosterol, gallic acid, ellagic acid, ethyl gallate, galloyl glucose and chebulaginic acid. Tannins: 1. It shows scavenging activity against mitochondrial lipid peroxidation. 2. It causes significant decrease in cholesterol level. 3. It shows antimicrobial activity against bacteria and virus. 4. It shows significant inhibition of microsomal lipid peroxidation and reduction in triglyceride levels in liver. 5. It show reduction in total acidity and peptic activity and increase in mucin content. Curing Diseases : 1. It is useful in cough, bronchitis and pharyngitis. 2. It is used in dyspepsia, flatulence, dipsia, and vomiting. 3. It is used in ophthalmopathy, strangury, splenomegaly, cephalagia and general debility. 4. 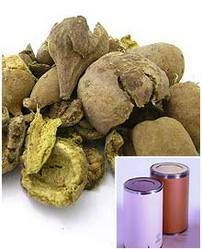 It is useful in skin diseases, leucoderma and greyness of hair.